Whether you're backpacking in Barcelona, skiing in Switzerland, or dining in Dubrovnik, it's probably a good idea to learn a few essential phrases in the local language. Or, at the very least, learn the word for beer -- and how to say it properly. But even if you're lazy or just flat out inept with languages, there are still quite a few places you can get away with speaking only English (without looking like a complete idiot abroad). 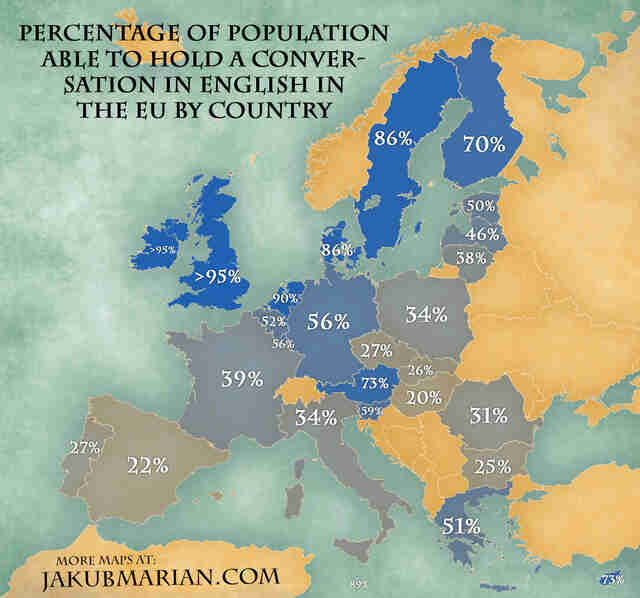 This handy map -- compiled by Czech linguist Jakub Marian -- displays which European countries are most proficient in English, and where you're likely to find a local that can hold an entire conversation with you. 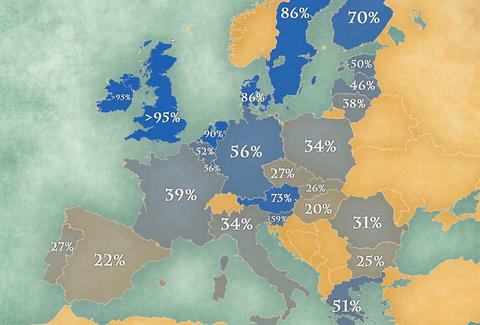 Marian used data collected by the "Special Eurobarometer 386" report from 2012. As expected, you'll find English speakers in the UK and Ireland (duh), though their accents might actually make them incomprehensible. But in the Netherlands, Denmark, and Sweden, more than 80% of the population are well-versed in English. And a vast amount of the population in Austria, Cyprus, and Finland, where more than 70% will be able to understand you, are your next best bets. You probably won't even need any liquid courage to strike up a conversation! As Marian points out on his website, "almost all EU citizens have had at least some contact with English during their life". But that doesn't necessarily mean the four people who live in the tiny Spanish town you're hiking through are going to be able to help you find your way back to your hostel. In fact, just 22% of the Spanish population can hold a conversation in the current lingua franca. But Spain's not the worst place to be without a phrasebook; that'd be Hungary, where just 20% can chat in English -- making it the European country least proficient in the language. Good thing Hungarian is really easy to learn. Check out the full results of the report on the map below.